Every New Year's Day I start a new Year list. I try to avoid seeing something like a Crow or a Robin for my first bird of the year. I usually head for a spot where there have been some good birds seen. Since I'm at the start of the year, I'll include the Year bird number when I see one for the first time. Every bird in this post will have that notation. 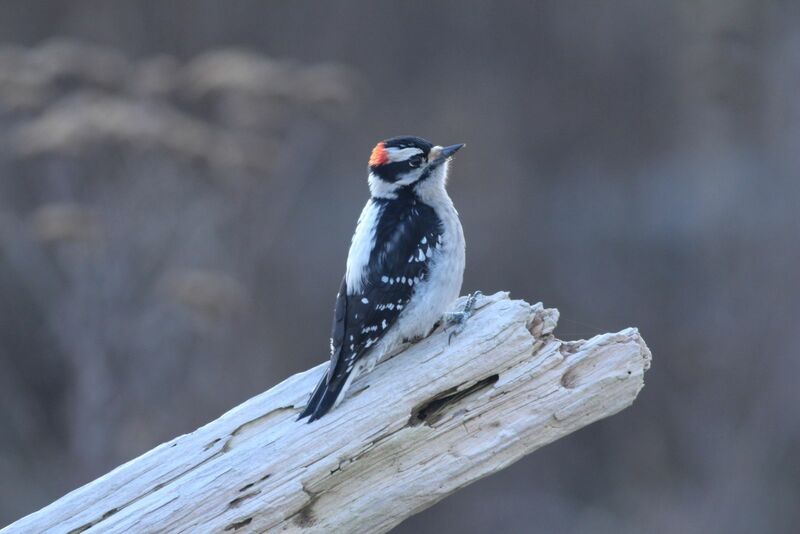 Before leaving, I glanced out the living room window and saw a Downy Woodpecker. I didn't have a camera handy and did not get a photo of one until Jan 21 at Brunswick Point. I'll use one of the photos I took there. 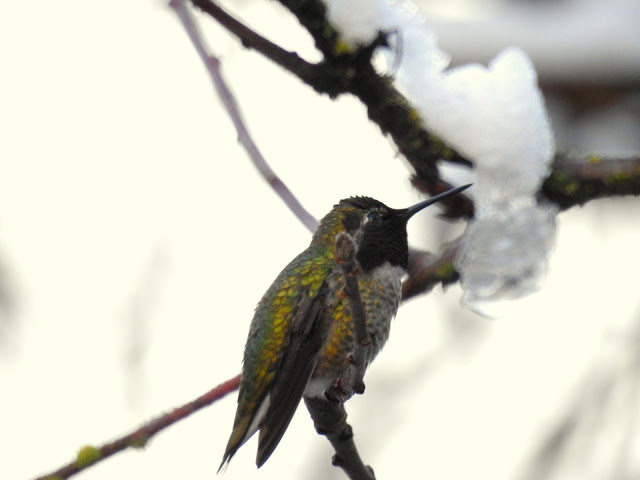 The next bird was our resident male Anna's Hummingbird. During the cold spell I was bringing in the feeder every night to prevent the liquid from freezing. The least he could do was pose for me on New Year's day. My first stop was Deas Island Regional Park in Delta. I hoped to see again the Pacific Wren I encountered on Christmas Day. I set out on the Island Loop trail that runs along the Fraser River. 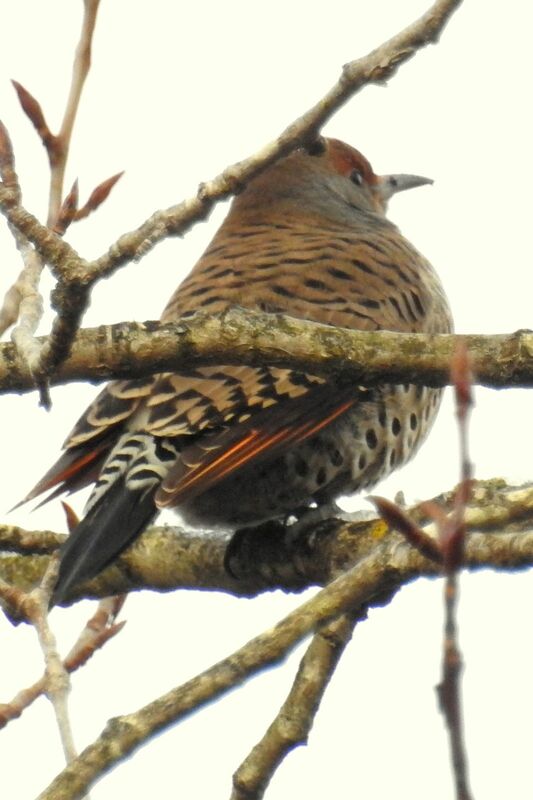 I heard a Flicker calling and located it high up in a nearby tree. It was very cold and the trail was covered in ice and snow. 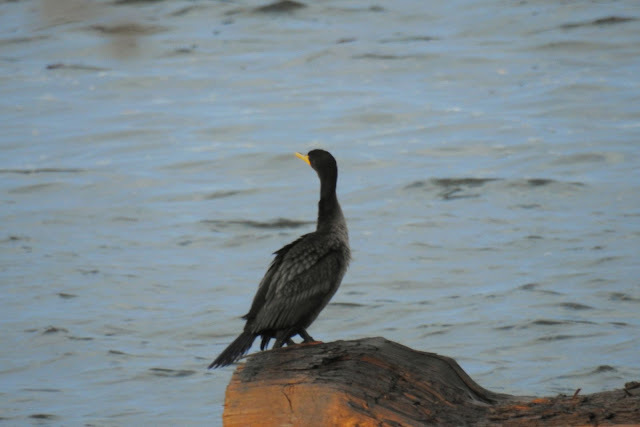 As the river came into view I saw a Cormorant on a log in the river. At first I thought it was stationary, but then I noticed that the log was floating west with the river. The Cormorant was saving energy by catching a free ride. I took the loop back to where I was parked and encountered two more familiar birds in the under-brush. 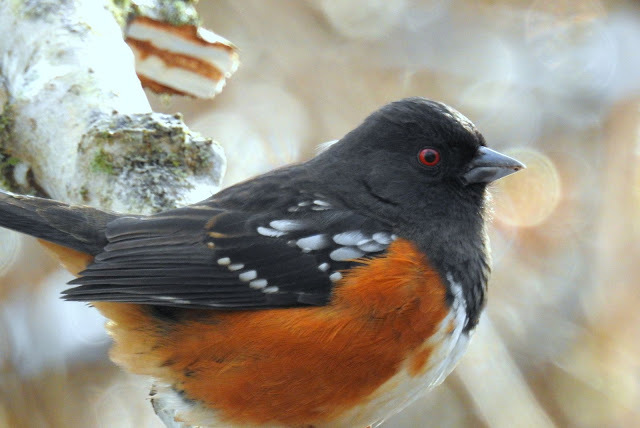 First was a Towhee. 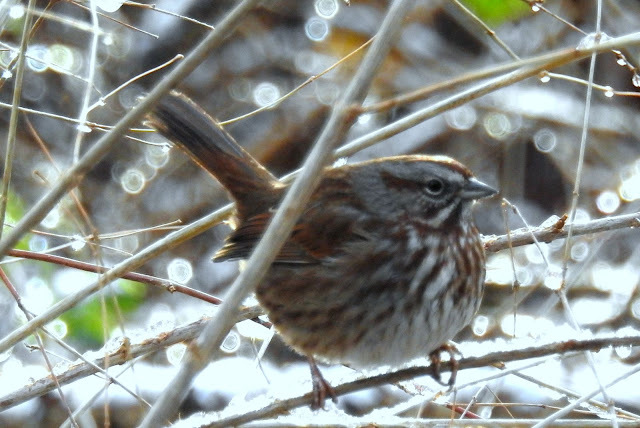 This Song Sparrow is really puffed up to insulate it from the cold weather. I left without seeing my Pacific Wren and decided to try the rural area on 60th Avenue. There is a resident Kingfisher that fishes in a small pond there. However the pond was frozen and the bird had likely moved to somewhere along the river. 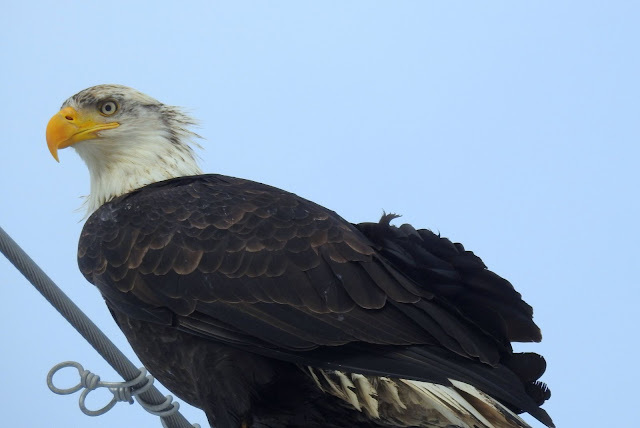 There were numerous Bald Eagles around, this one on a power line. Even though I had snow tires, it was tough going on the rural roads. 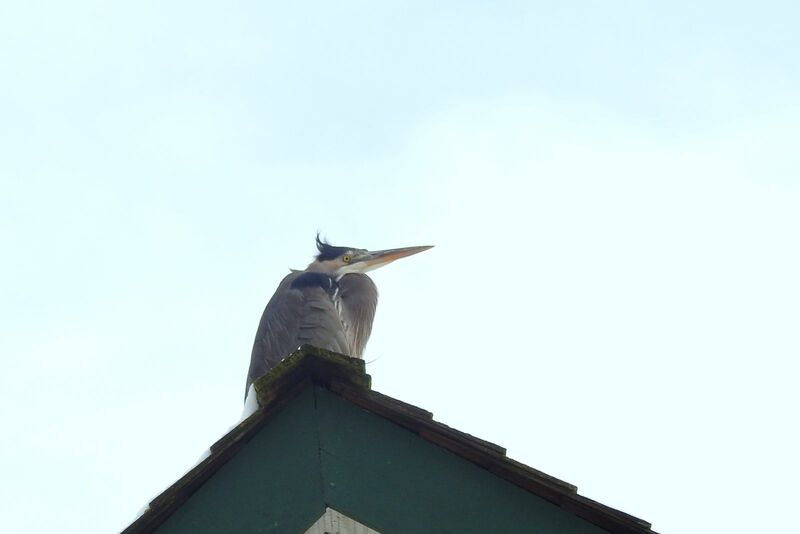 I spotted a Heron in an unusual setting, the poor thing looked very cold. 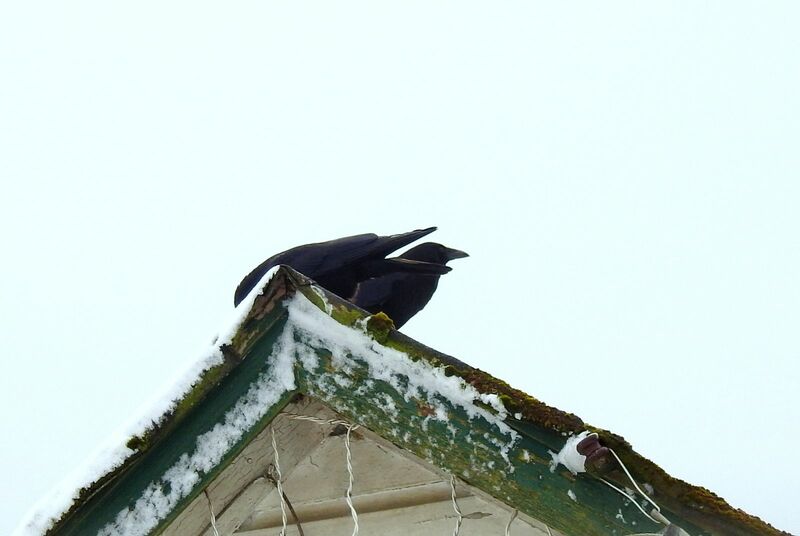 These crows were on the next building over, they probably deal better with cold weather than the Herons. 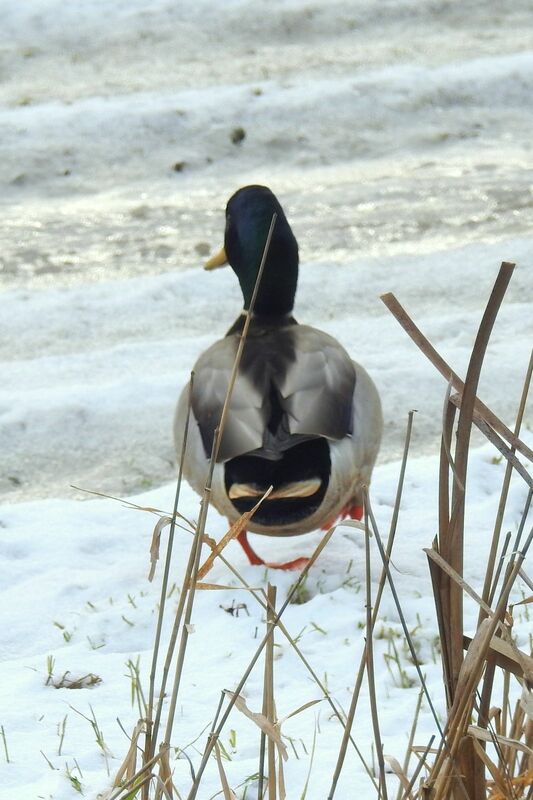 The ducks weren't looking too happy either. My next stop was Ladner at 72 St on the west side of Highway 99. 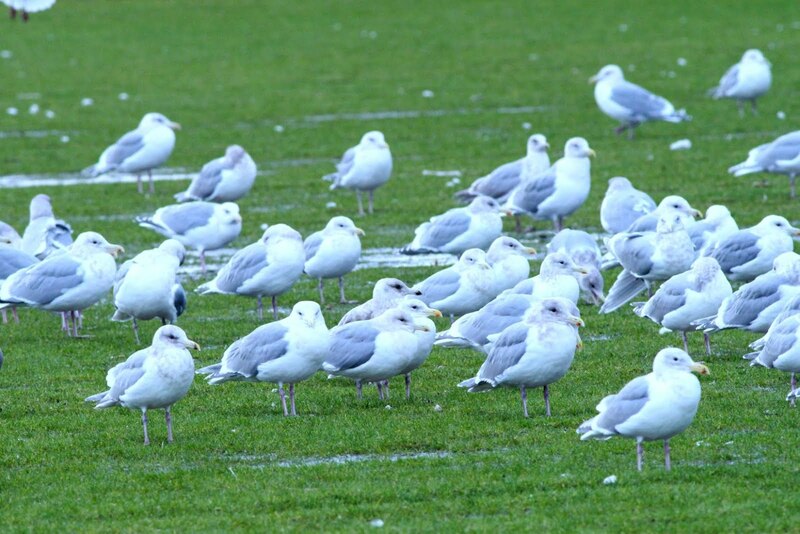 I was going to make a quick stop at the turf farm where gulls congregate by the hundreds. Interestingly, this area had missed the big snowfall, so it was cold but mostly bare. The only Gulls I saw were the common ones. I was about to head home but stopped to chat with Monica, a local birder who had been our the 2016 Spring Okanagan birding tour with me. 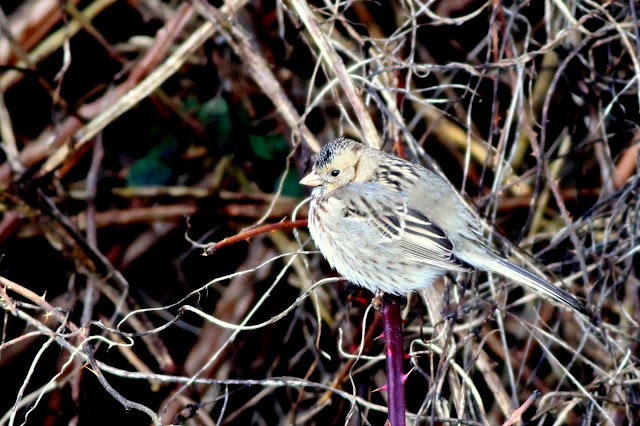 She told me she had seen a Harris's Sparrow at 96 St on Boundary Bay. 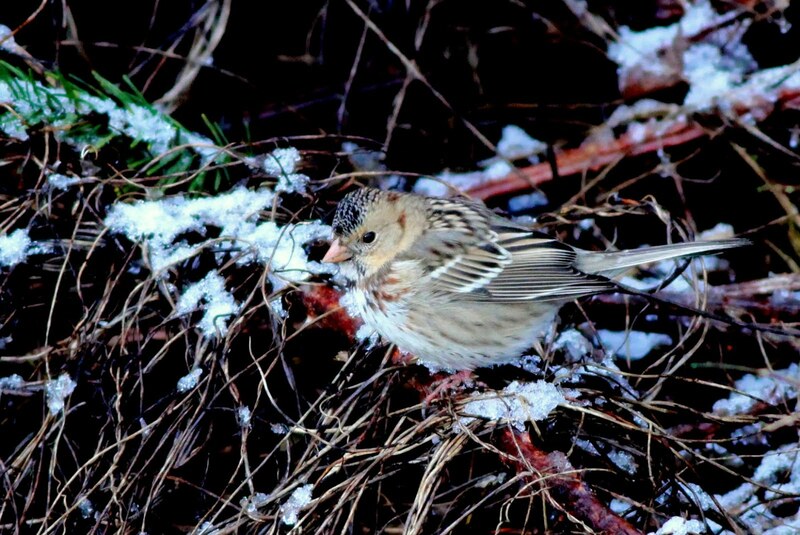 This is a rare sighting for the Lower Mainland as this sparrow breeds in the Arctic and summers in the Great Plains. The two kilometre drive south put me back in the snow and ice zone. I was on the foreshore and a very cold wind was blowing in from the ocean. 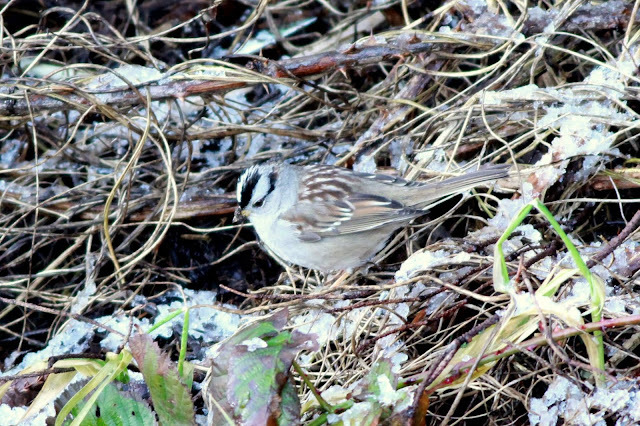 The bird was in with a mix of White-crowned and Golden-crowned Sparrows. A very helpful couple were just leaving and they told me where they had seen the bird. I got a nice shot of a White-crowned Sparrow while searching for the Harris's. Finally I caught sight of the Harris's Sparrow. This is the first of this species I've seen since 2015. This is a first winter bird, so the black on the throat has not fully come in yet. So it was lucky 13 on New Year's day, I'd be back at it the next day.